After a severe car accident most people will feel pain from their injuries immediately, but this is not always the case. When your body is put in a dangerous situation, your adrenaline kicks in with fight or flight, and you may not even notice that you are injured right away. Some injuries will even take days, weeks, or months to show symptoms. You may even get a clean bill of health from the ER physician, but it is important to note that the ER physician’s job is to assess and make sure that you will not die or lose a limb in the next 24-48 hours. Many people think that just because they went to the ER and were checked out, that this is the end and there is nothing else to be done – this is not the case, especially with delayed symptoms. 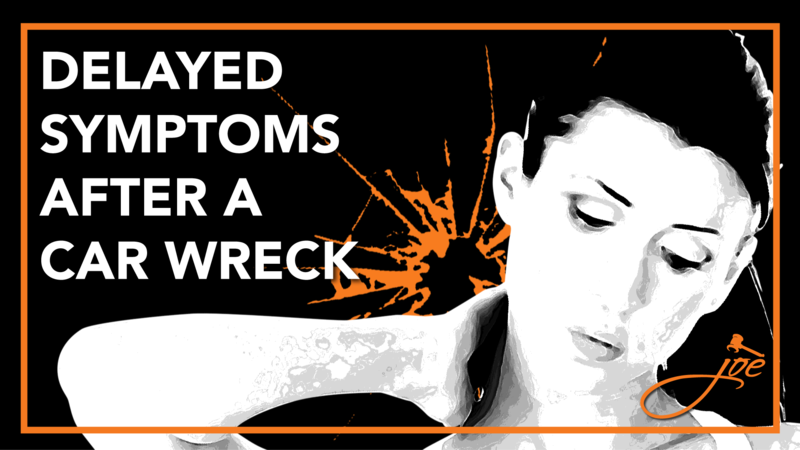 There are a few reasons injuries may take a little time to show symptoms. The first is swelling and inflammation. This takes place over time, so you may not immediately notice anything out of the ordinary. The second is that people normally “take it easy” from strenuous activities after a car accident, however when they return to daily life and activities, they begin to notice all kinds of injuries and pain. If you are experiencing no pain after a car accident, it is still recommended that you see your general practitioner or treating physician right away. This way, a doctor will be able to thoroughly examine you to ensure nothing is wrong, or they may discover an injury that would not have shown symptoms until weeks or months later. It is important to allow your physician to conduct these tests and then order additional, more thorough tests, with a referring specialist. So what now? It’s not unusual for injury-related pain after a car accident to be delayed, and in many cases you may not even know you have a serious injury until later. Below are some guidelines to help ensure that you get the compensation you need if car accident-related pain doesn’t show up until days or even weeks after the incident. Sometimes a headache is just a headache. But if you were recently involved in a car accident, neck or head pain could indicate a more serious injury that wasn’t discovered at the time of the accident or in the ER. If you have suffered any of the following types of pain after an accident, even if it’s delayed, get immediate medical attention. Headaches – Pay special attention to the location and severity of the pain. It could be stress-related or a sign of concussion, brain injury, whiplash, neck injury, or even a blood clot. A serious headache also could be a sign of post-traumatic stress disorder (PTSD) following the accident. Pain in the Neck or Shoulders – This is often a sign of whiplash (a catch-all term for several different injuries), which is sometimes experienced right after an accident but sometimes doesn’t emerge until several days later. Neck and shoulder pain could also indicate a spinal injury such as a herniated disc. Back Pain – Back pain, especially in the lower back, may also indicate a whiplash-related injury. It also could signal a sprain, herniated disc, or other soft-tissue injuries (such as muscle damage). If accompanied by tingling or numbness, it could also point to pinched nerves. Numbness, Tingling, etc. – These types of sensations, in addition to weakness in the limbs, often indicate a herniated disc that pinches or presses up against nerves in the spine. This pinching can cause pain, tingling, numbness, and other sensations throughout the body. Abdominal Pain – Internal, soft-tissue injuries can be very serious — even fatal — if left untreated. If you experience abdominal pain after an accident (which may surface days after the incident), get immediate medical attention. Internal bleeding also may cause headaches, dizziness, and deep bruising. Emotional Pain and Suffering – After the initial post-accident chaos subsides, you may experience depression, anxiety, or even PTSD. This could be related to the actual incident, a result of physical injuries, or both. Brain injuries also may cause emotional pain or personality changes. You should wait until you have been fully evaluated by a medical professional, and consulting with your attorney, before signing anything the adjuster puts in front of you. You should also wait long enough to make sure all injuries from the car accident have fully manifested themselves. Your doctor can help you determine how long this needs to be. If you sign a release, and an injury shows up later, you cannot then go back to the insurance company and ask them to pay for your medical treatment. You waive your legal right to pursue that compensation when you sign the release. 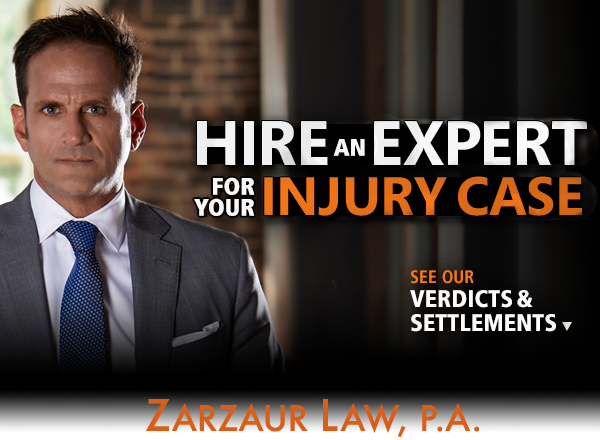 This is why consulting with a board certified civil trial attorney specializing in personal injury law, like Joe Zarzaur, is important. If you or a loved one has been involved in a car accident and are suffering from delayed symptoms, it is important to consult with a Board Certified Trial lawyer who has the knowledge and experience to help you. We know accidents can be stressful and want to make the process as easy as possible for you. Call Zarzaur Law, P.A. today at (855) Hire-Joe for a free legal consultation or visit www.zarzaurlaw.com.